Over-Hyping Entrepreneurship? I Am Guilty As Charged! There was a time when my first world problems consisted of hours upon hours of lengthy commuting and dead end jobs. This wasn’t for just a couple of years – this was for over a decade, in fact. Now I consider it my mission to help people who are bored and unfulfilled because I can bring more meaning to their lives. How did I swap a meaningless life for a meaningful one? I owe a lot to this website. I owe a lot to WordPress. One of the ways I got work online was to blog about what I was doing. As boring as it sounds and – trust me, it was very boring – at work I was creating PDFs. I used to write blog posts about creating PDFs and then someone phoned and asked me to create a PDF for him. This guy was an executive at a Fortune Global 500 company. I,ve been working with this company for nearly 10 years now – they,ve paid me many ten of thousands of dollars in fees. And now I,m doing the same thing –blogging about what I’m doing. However, it,s less boring now. 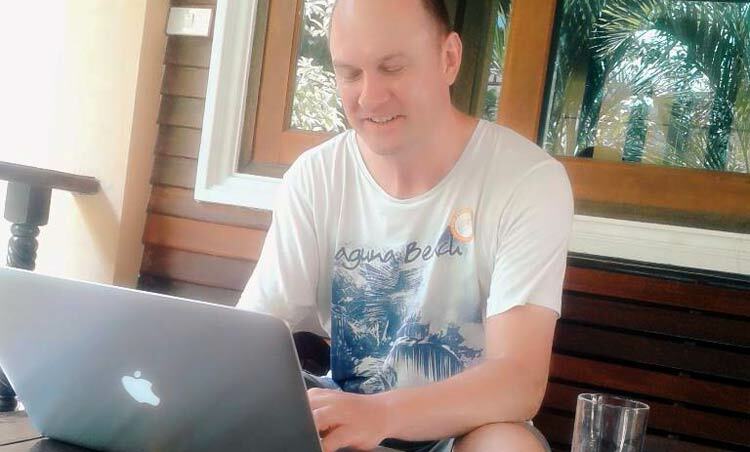 Now I,m writing about earning passive income from selling video courses and e-books, living in Chiang Mai and my eight-month long “vacation” in Southeast Asia. We are all marketers. We all have to sell ourselves. I,m “guilty” of selling my lifestyle too. Am I going too far? Everyone of us hate the sleazy internet marketers that stand in front of an expensive cars or houses and tell you it’s easy to make money online – as long as you buy their product. I saw this video which says that digital nomadism is being over-hyped. Digital nomads are usually developers, designers, copywriters, marketers etc. As they are location independent, they left the country they were born in to work in foreign countries that are cheap, nice to live in and have good internet. All they need to make a living is Wi-Fi. The guy in the video says you shouldn’t put images of people having fun with online businesses on the beach. As I have posted images of my laptop in exotic locations, I feel the need to defend myself. In my opinion, entrepreneurship should be hyped up. If I’d been encouraged earlier, I might have started sooner. That would have been a good thing. One more entrepreneur means one less angry, bitter individual commuting to a job they hate. Entrepreneurship is not only good for individuals – it can be good for society at large. Sometimes we think everyone sees the world as we see it. Digital nomads think that they,re “a thing”. Digital nomads are migrants who,ve left the country they were born in to work. The last five thousand years of world history includes huge migrations of people looking for food, work or better living conditions. Modern Americans are the descendants of migrants who left the country they were born in to work (either voluntarily or involuntarily). In fact, if you go back far enough, we are all descended from migrants who,ve left their home country in order to find food, work or make money (unless you happen to come from the Great Rift Valley in Ethiopia). So they,ve not really invented anything new. Only the tools they,re using are new. Clockwise from top left: Pai, Chiang Mai, Otres Beach, Koh Phangan. This is entrepreneurship and I,m happy to hype it up. I’m doing work that I love, that’s benefitting other people from some of the world’s most beautiful places. Yes, it can be hard. But not as hard as going to work in London on a cold January morning. I shouldn’t imagine working in a paddy field or a factory would be much better either. I,m glad to inspire people to enjoy what they do and live happier and healthier lives. I don,t see anything wrong with promoting the benefits of doing this. What,s the counter argument? 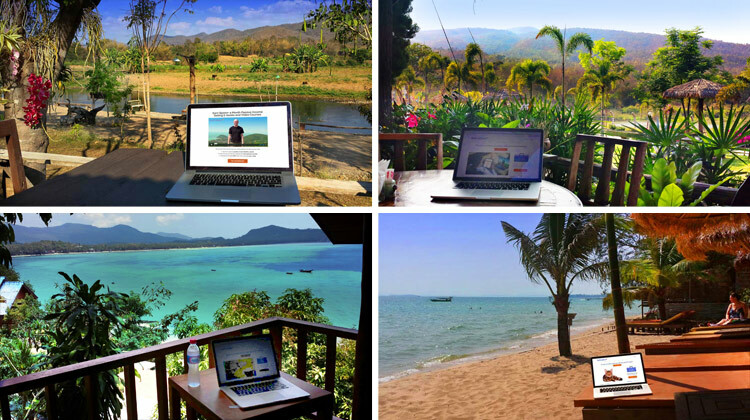 Someone tries entrepreneurship, fails and lives the rest of their life impoverished on a beach in Thailand? I’ve never met a failing entrepreneur who had given up, blaming it all on their over-hyping guru. Gurus are a great target – don’t get me wrong – it’s good to question what they say, constantly. However, failing entrepreneurs just keep going until they find something that works. That’s what they do. Is entrepreneurship or location independence hyped up? Am I annoying you by posting my holiday photos? I’d love to hear what you think in the comments. I agree Rob. Hype it up if it works for you. I’ve just moved to Phnom Penh from a cold and wet London. My plan here is to spend time on my blogs ( helping people solve their problems ) and do a bit of freelance consultant work. It might not work, as have other things I’ve tried, but its all about learning the lessons that set you up for success the next time. Either way, I’m the happiest I’ve been in years. I’ve been the corporate slave, and it didn’t work for me, however well paid I was. I wouldn’t have my life any other way right now. Sell the life of the Entrepreneur and there is absolutely no need to justify yourself. Genuine people somehow seem to find happiness, whatever means they choose. Hey Chris, I’m totally with you there. I never got to Phnom Penh but I spent some time in Siem Reap and Sihanoukville/Otres Beach. So glad to hear about your life at the moment. Sounds great. You’re right “it’s all about learning the lessons that set you up for success”. Today everything is hyped up. But I prefer hyping entrepreneurship than corporate slavery. I’m totally with you there, Michal. Sure, some people hype it up. But I don’t think there is anything wrong with talking the talk if you’re walking the walk.! I don’t get annoyed seeing holiday pictures; it’s a great visual that keeps me motivated. Hey Mike, I’m totally stealing that quote for my Facebook Page. 🙂 Thank you for the encouragement. Yes, a lot of people like the exotic travel photos as it keeps them motivated – which is what I’m trying to do. I love the way you hype entrepreneurship. They way you do it inspires me. You have great pictures and your content is awesome. You provide me with your monthly income and expense reports. You tell me that this is challenging, but not impossible. You tell me of the products that you have created. I have brought many of your products. That is even more content. Your blog, with so many articles, provides a realistic view of having a web business. A business that you can take anywhere, as you have shown me with your eight months of a working vacation. I want to thank you for your hype. Whenever I am thinking about all of the reasons I dislike working in the corporate world, it is great to know that I have a way of escape. I have a friend who has shown me how this is possible for me. You have put hope in my dreams of having my own web business, of becoming a web based entrepreneur. I cannot say enough about this hope that you have given me. Thank you so much. Thank you very much. Hey, Rene, thank you so much for that comment 🙂 I’m glad I give you hope and dreams. But the action depends on you!